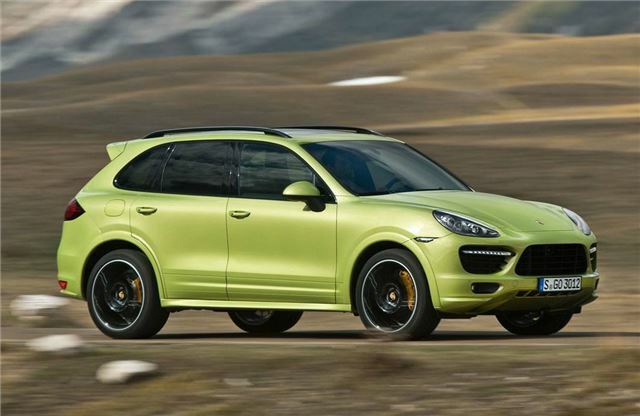 Porsche has revealed the new GTS version of its Cayenne. Sitting between the Cayenne S and Cayenne Turbo, the GTS is fitted with an uprated 4.8-litre V8 engine with 420PS giving a 0-62mph time of 5.7 seconds. It goes on sale in July 2012 and is priced from £67,147. The engine comes with an eight-speed Tiptronic S gearbox and both have been tuned to be more responsive. As a result the top speed is 162mph while 0-100mph takes 13.3 seconds with an average claimed fuel economy is 26.4mpg. The GTS also comes with modified chassis settings with tauter suspension, Porsche Active Suspension Management (PASM) and a 24mm lower ride height compared to the Cayenne S.
The front end styling is influenced by the Cayenne Turbo and there are xenon headlights, high-gloss black window surrounds, larger side skirts and wider wheel arches. The GTS also get a twin-wing roof spoile and a sports exhaust system. Inside, it gets leather and Alcantara upholstery, front sports seats with eight way adjustment and a SportDesign steering wheel with paddle shifts. The GTS is also fitted with the Thatcham Category 5 approved Porsche Vehicle Tracking System (VTS) plus customers get a complimentary course at the Porsche Experience Centre in Silverstone.